The previous A1 was a roaring success, thanks to its fashion-led design and trademark solidity, trading blows with the likes of the Mini Cooper. The new car swaps cuteness for sharp angles and motorsport-inspired styling, while hopefully retaining everything that made its predecessor so popular. Next up there’s a 1.5-litre four-cylinder with 148bhp or a top-spec 2.0-litre with 197bhp – lifted from the VW Polo GTI, but not badged as one of Audi’s hot ‘S’ models. The lowlier pair of engines can be had with six-speed manual gearboxes or optional seven-speed dual-clutch autos, while the 2.0-litre is automatic-only. The 1.0-litre is a really sweet engine, with a welcome slug of torque between 2,000 and 3,000rpm making relaxed progress very easy. It’s very refined at a cruise, with just a hint of three-cylinder thrum at low revs. It pairs well with the six-speed manual, too, which has a reassuring solidity to its action. The 1.0-litre isn’t especially fast, but then nor is the 1.5-litre – and that’s noisier, thirstier and less pleasant to use. Topping the range is the 2.0-litre, which is powerful and turns the A1 into something of a hot hatchback – but it’s likely to be very pricey to buy. There’s not a lot of excitement to be had, though. The A1 doesn’t handle anywhere near as sweetly as a Mini or a Ford Fiesta, as it doesn’t feel as light on its feet. That’s not really backed up with a cushioned ride, either – all A1s get a sporty suspension setup, which despite taking the edge off poor surfaces does jolt occupants over larger imperfections in the road. There are divisive elements – there’s a rather wide C-pillar, inspired by the Q2, and the triple slots between the bonnet and the grille lend an aggressive edge to the car. But it’s possible to customise the A1 to within an inch of its life, so you need never see two the same – available for testing were some really eye-catching combinations. Sea-green bodywork with bronze wheels, anybody? Of all the cars we expect to disappoint with their interiors, the A1 wasn’t high up the list. We’ll start with the good. There’s far greater room in here for passengers and luggage – thank the MQB platform for that – and the A1’s 335-litre boot is on a par with anything else in this segment. The seats are also very comfortable and well adjustable even on more basic models. The big disappointment is with the quality of the materials. Sure, areas such as the top of the dashboard are crafted from squidgy soft-touch plastic – but the centre console and especially the doors feel downright cheap. Given that you spend a lot of time with your elbows resting on the door cards, the hollow feel is less than pleasant – and not something we’d expect even from the smallest Audi in the range. 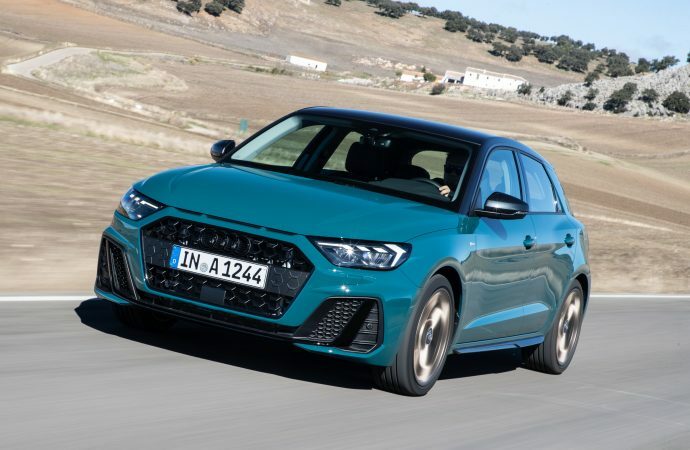 Audi gave us almost everything we expected with the A1 – impeccable driving manners, sharp styling and a range of high-end equipment, plus the personalisation touches that will make it so popular with the crowds of buyers who might otherwise choose a Mini. Some of the interior quality is disappointing, but otherwise this is an excellent supermini – albeit, for a high price.